Spring striped bass fishing is a sure cure for cabin fever! However, the water is typically cold and the stripers can be a bit sluggish. Selecting the correct tackle can make the difference between curing the fever or suffering an extended winter (as if being cursed by a some underground dwelling over sized rodent)! 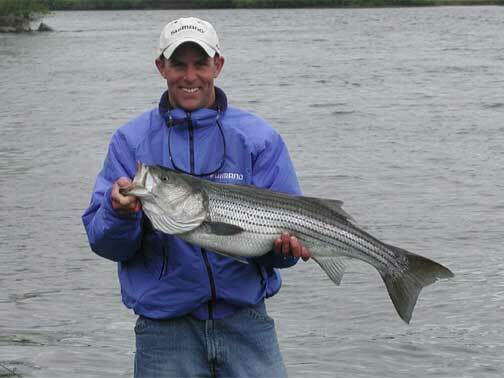 Here are some spring striper tips that will help you catch more fish. Spring striped bass are typically going to be found in shallow areas where water is warming faster than the surrounding waters. The warmer water will certainly have more life in the early season (that can switch later in the season when oxygen levels start dropping). The fish are typically feeding along the bottom picking up crabs, worms, shrimp, and small bottom fish. Structure such as rocks, eel grass, and docks will hold the most bait. The cold water certainly makes the stripers less aggressive. A slow steady retrieve or a slow sweeping retrieve will typically be the most effective. Solo striped bass are not very aggressive. However, if you find a decent school of fish, the competitive nature will make them more aggressive and a faster steady retrieve may be more effective. Experienced anglers will try different retrieves to convince the fish to strike. It is critical to understand that stripers can be present and just not interested in an artificial bait unless the presentation is perfect. We have drifted and or slow trolled live sandworms and crushed the fish at times when no artificial lure could draw a strike. Your best bet will be a spinning rod and reel combo suitable for 12-20lb braided or fused line. The optimal rod is 7′ feet long with a fast to extra-fast action and capable of handling lure weights up to 1 ounce (though you can typically throw lures 50% heavier than the rating). Most anglers prefer to use lighter line in the spring because lure weights are typically less than the weights typically used when plugging stripers. Braided and fused lines are a must. The thin diameter is going to provide maximum casting distance especially when using small lures. The lack of stretch enables the angler to detect even the softest pickup and allows for the best possible hook-set. It also allows the angler to carefully control the action of the lure. Using 20lb line (sometimes even as much as 30lb) will ensure that you can pull bigger fish away from structure. However, if you are typically throwing very small lures and structure isn’t an issue 12-14lb line is adequate. The main line should be tipped with a 24-30inch 2olb fluorocarbon leader tied directly to the lure or attached with a small snap. The main line can be attached to the leader using either a small swivel or an albright knot. Swimmers – Hard-bodied lipped swimming and deep diving lures that have decent action when retrieved slowly. These lures can also be jerked through water in a stop-and-go retrieve that can be deadly when bigger fish are around. Soft Swimbaits – Minnow , herring, and shad patterned soft baits with broad paddle tails that have a distinct swimming action when retrieved slowly. These baits will typically run deeper than swimmers. Grubs – These can be the most effective spring striper bait but it is critical to have a wide variety of colors and styles. White curly tails (in various lengths) are a good basic choice, but other colors can also product fish. Experienced anglers try their best to “match the hatch”. Typically using pink when shrimp are present, green, silver, or white for spearing, etc. The grubs are always fished on small jig-heads or bucktails sometimes as small as 1/8oz. Grubs are typically worked very slowly across the bottom. A variety of Gulp soft baits such as shrimp, and mullet are very popular spring choices. Bucktails – The traditional buctkail tipped with pork rind or a grub can be deadly in the hands of an experienced angler (and virtually useless in the hands of a novice). The difference between a bucktail and a grub is the buoyancy imparted by the hair which reduces the sink-rate. This allows the bucktail to spend more time off the bottom. Color choices are the same as for grubs. Learning how to properly fish a bucktail is time well spent on a technique that can be used for nearly any species. 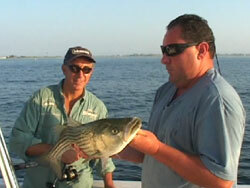 Click here for more about Striped Bass Plugging.